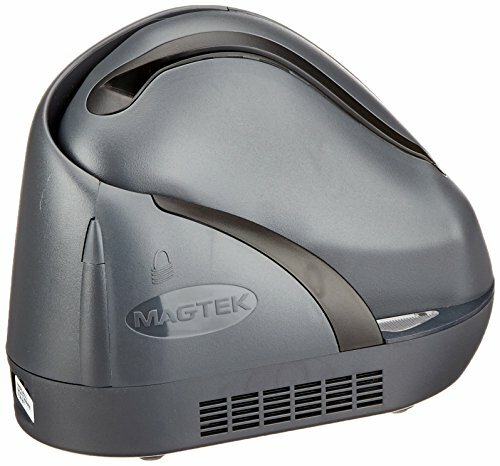 The MagTek 22370001 ImageSafe MICR check reader can be used at a point of sale to scan a check, read the MICR characters that appear along the bottom of the check, and create an electronic copy, and it contains an integrated magnetic card reader to read a credit or debit card or another magnetic stripe card to complete a transaction. The check reader can create digital copies of the front and back of a check in a single pass in grayscale at 200 dpi (dots per inch). The check reader's USB cable can be plugged into the USB port of a computer or another host system (sold separately) to transmit check or card data. An authenticator encrypts card data for security. An LED indicator turns red to alert the user of a decoding error. This product weighs 2.2 lb. and measures 6 x 3.9 x 8.1 inches (H x W x D). (H is height, the vertical distance from the lowest to highest point; W is width, the horizontal distance from left to right; D is depth, the horizontal distance from front to back.) It accepts checks that measure up to 4 x 9 inches (H x L) and can read MICR (magnetic ink character recognition) characters in E-13B or CMC-7 fonts. MagTek manufactures card and check readers, personal identification number (PIN) pads, scanners, and card and PIN issuing systems. The company, founded in 1972 and headquartered in Seal Beach, CA, meets International Organization for Standardization (ISO) standard 9001:2008.